All acupuncturists at Acupuncture Together are licensed to practice acupuncture in Massachusetts, hold Master of Acupuncture and Oriental Medicine degrees and are Diplomates of the NCCAOM (National Certification Commission for Acupuncture and Oriental Medicine). Justine Deutsch Myers, Lic. Ac. 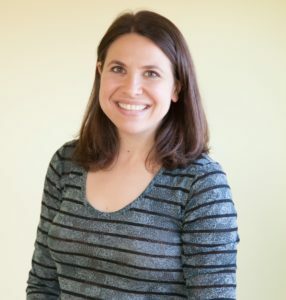 Justine earned a Master of Acupuncture and Oriental Medicine (MAOM) degree from the New England School of Acupuncture in August of 2007 and is licensed to practice both acupuncture and Chinese herbal medicine. Her graduate studies focused on Chinese style acupuncture and Chinese herbal medicine, and she has done post-graduate coursework in distal point treatments for acute and chronic pain as well as the treatment of infertility, pregnancy conditions and various internal medicine conditions. Justine has extensive clinical experience successfully treating a wide range of conditions. Justine was a board member of the Community Acupuncture Network in 2010 and 2011, and now serves as a volunteer for POCA, the People’s Organization of Community Acupuncture. She has taught courses on distal point treatments and Chinese herbal medicine at community acupuncture workshops. Justine’s work in the community acupuncture setting began at Manchester Acupuncture Studio in New Hampshire in September of 2007, where she practiced until opening Acupuncture Together in May of 2008. Prior to becoming an acupuncturist, Justine obtained a B.A. in mathematics with a minor in psychology from the University of Rochester. When she’s not working, Justine is usually busy taking care of her two young children. She enjoys spending time with her family and friends, running and walking outside, gardening and cooking. Noora earned a Masters of Science degree in Oriental Medicine (MSOM) from Dongguk University in Los Angeles in 2017, and also has completed post-graduate training in distal point treatments for a wide range of health conditions. She is licensed to practice both acupuncture and Chinese herbal medicine. In addition to her Traditional Chinese Medicine training, Noora is a practicing member of the National Association of Holistic Aromatherapy (NAHA). Noora is passionate about helping others improve their health to discover their own greatness. Her goal is to help individuals of all ages to make a commitment to a healthy, happier lifestyle by providing a holistic and balanced approach. Noora enjoys cooking, reading, creating essential oil blends, watching movies and spending time with family and loved ones. Eric graduated from the New England School of Acupuncture in 2017 with a Masters Degree in Acupuncture and Oriental Medicine (MAOM). He is licensed to practice both acupuncture and Chinese herbal medicine. He has practiced at several hospitals and clinics in the Boston area including Boston Medical Center and Lemuel Shattuck Hospital. Before attending acupuncture school, Eric received his B.A. in Philosophy with a Certificate in Buddhist studies from the University of Massachusetts in Amherst. During his undergraduate time, he decided to further his interest in Buddhist philosophy by going on a 2-year retreat at the Odiyan Buddhist Retreat Center & Monastery in Northern California. While living at the Monastery he studied the Tibetan Language, Tibetan style Yoga, and various other Buddhist Meditation practices. Shortly after returning to school and graduating, Eric began his yoga teacher training with Triyoga Boston where he earned a 200-hour Yoga-Alliance-Certification, becoming a Registered Yoga Teacher (RYT). Eric has a passion for health and wellness and is excited about working in a community acupuncture clinic. Trista has been working at Acupuncture Together since the spring of 2014. She’s a Massachusetts native who has spent much of her time traveling around the world. Since returning from her travels, Trista has been living in the Boston area and recently finished her undergraduate degree in Humanities at the Harvard Extension school while also taking care of young children. In her spare time she enjoys reading, writing, drawing, playing guitar, riding her bike and yoga. Denise began working at Acupuncture Together in January 2017. Aside from working at Acupuncture Together Denise is a retired dog walker and a local comedian – no joke! A native of the North Shore, Denise has a wicked sense of humor and aims to make your front desk experience a happy one. Betsy joined the front desk staff at Acupuncture Together in August of 2018. Born in Kansas City MO, Betsy’s family moved to Maine when she was 11. She first came to the Boston area to study painting at the Museum School of Fine Arts. She went on to earn her BA, focusing in Digital and Media Arts, at UMass Boston, minoring in Psychology. In 2012 she entered the Bookbinding program at the North Bennet St. School. She now combines all her art training – drawing, painting, image manipulation, design layout, and bookbinding – to craft fine artist books. She is a Quaker, a mom, and an avid sci-fi fantasy reader. Will started at Acupuncture Together in December 2018. He grew up in Roslindale and currently lives in Belmont. In 2012, he graduated from Hampshire College, where he studied creative writing. He likes to blend sci-fi, horror, and crime in his fiction. In January 2019, he and his wife welcomed their first child, a girl, into their family. Will is primarily a stay-at-home dad, although he enjoys the opportunity front desk work at Acupuncture Together gives him to get out of the house and interact with other adults a few times a week.